Triverdi published the cartoons in the “Black & White – Online Cartoon Magazine for Human Rights” on Wednesday to attract attention to the systematic detentions and massive human rights violations in Turkey and to show solidarity with the persecuted women and babies. Turkey survived a military coup attempt on July 15 that killed over 240 people and wounded more than a thousand others. Immediately after the putsch, the AKP government along with Erdoğan pinned the blame on the Gülen group, led by US-based cleric Fethullah Gülen. The group denies the accusations. Hundreds of human tragedies in Turkey have been reported since then. 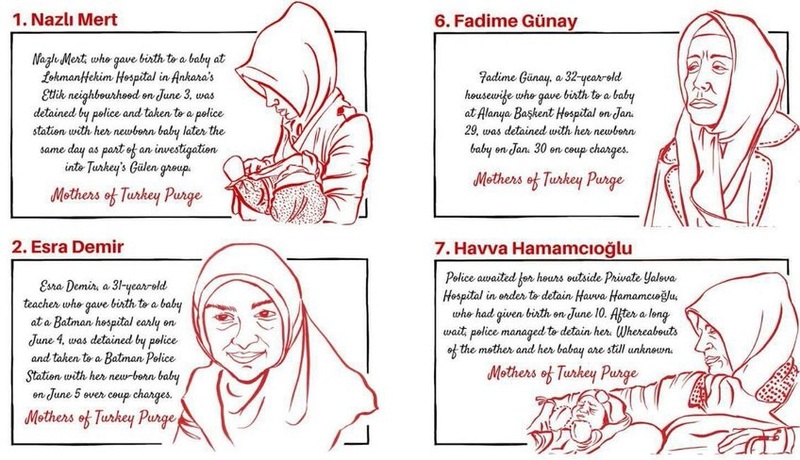 Turkish officials, for instance, have systematically been detaining women over aleged links to the Gülen group either when they are pregnant or shortly after giving birth. In June, teacher Esra Demir was detained a day after giving birth in Batman.